Pretty smoked salmon verrines are an easy recipe to make, but look so impressive! Ideal for a light first course for a dinner party. A dash of care with presentation lifts a simple dish from something straightforward and easy to something a bit special, and these smoked salmon verrines are a perfect example. Even the name can impress: verrine rolls around the tongue impressively (even more so in a French accent), and sounds most professional even though the dish is just ingredients layered in a glass. In the Fuss Free kitchen it is all about obtaining a good effort to glory ratio. 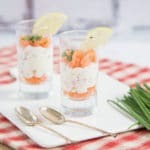 My smoked salmon verrines are perfect for a first course, even an amuse-bouche, or as a part of a brunch, maybe served with some scrambled egg? You don’t need to spend much on the smoked salmon; cheaper offcuts are perfect for this dish, and are sold in most supermarkets. 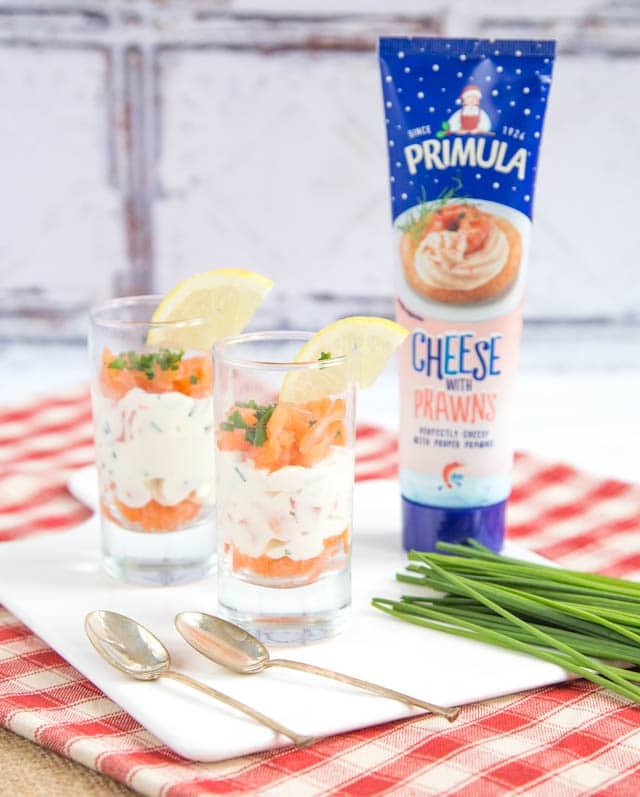 Primula with prawns my favourite flavour and brings back childhood memories of a Primula sandwich on the beach – way back in the day when the Primula used to come in a metal tube which you really had to squeeze to get the last drops out. If you don’t like seafood Primula have a range of 6 flavours to choose from, this would also be delicious made with the original or chive flavours. If you try this Smoked Salmon Verrines please tag #FussFreeFlavours on Instagram or Twitter. It is amazing for me when for me when you make one of my recipes and I really do love to see them. You can also share it on my Facebook page. Please pin this recipe to Pinterest too! Thanks for reading Fuss Free Flavours! Pretty smoked salmon verrines are simple to make, but look impressive. Ideal for a light first course for a dinner party. Lightened up with low fat yogurt. Layer a quarter of the smoked salmon at the bottom of a shot glass. Mix Prawn Primula, crème fraiche, half the smoked salmon, chives, lemon zest and season with salt and pepper. Spoon the mixture into a layer on top of the smoked salmon, and top with the remaining salmon.